There's been a lot of talk about Bitcoin and the electronic monetary system as both a sound mode of exchange and a substitute for conventional hedges against inflation. Bitcoin and its various counterparts are indeed fine ideas, and they unquestionably offer grand excitement for the fly-by-night-type investor; however, if you intend on planning for the long term, you may want to look beyond the gimmicks. Much like the tulip mania of the 1630s, or MySpace and its preceding dot-com flurry of the 1990s, and the eventual departure from Twitter and Facebook, Bitcoin and the other crypto-currencies will have their fame and will fade into the night, eventually forgotten by most but remembered by some as a cautionary tale. Let us remember, money can conceivably take any form. The most effective form of money, however, is one which is valuable, usable, predictable, portable, divisible, acceptable, durable, fungible and scarce. The latter two of these characteristics are distinguishing traits of the most sound forms of money, as history proves that other forms absent those traits may in fact perform more than adequately in their function as money. Above all, money must be accessible and tangible, or at the very least immediately convertible into those forms. All other media are far too manipulable and susceptible to losses, trickery, theft, systemic corruption, manias, and failures to deliver. In the end, the best forms of money are valuable commodities which are effective mediums of exchange and practical stores of value. In a market of collapsed fiat currency, can one reasonably expect a sustained move toward an equally baseless alternative? Bitcoin's illusory success is a mere function of its perceived value promised elsewhere in the market. Its value is otherwise inaccessible, for it possesses none outside of this unknown and highly volatile and unpredictable mode of exchange. Furthermore, the popular conversion of Bitcoin into USD grants the electronic monetary system some practical utility, yet a significant measure of recessed demand in fiat currencies, such as a massive unloading of USD by foreign holders, offers an untested scenario for Bitcoin, which indubitably hinges upon its developing convertibility by market vendors. In the event of any such financial crisis, one is unquestionably better served by possessing tangible assets of real, practical, and representative value. As opposed to digital holdings which offer no practical or immediate benefit until liquidated, commodities and precious metals offer utility in their physical forms without ever requiring any liquidation or convertibility into other forms. Their utility as money is and has historically been a consequence of their satisfaction of the aforementioned characteristics of sound money, effectively becoming a worthwhile possession for both their easy exchange for more specific demands -- solving the inefficient nature of the prior system of coincidence of wants -- and their intrinsic physical value alone, which automatically serves to hedge against risk and loss of market purchasing power as a tangible store of value. Money has historically taken many forms, from livestock and sacks of grain to salt, tobacco, and various forms of precious metals, including gold, silver, and copper. The fiat currencies of today -- the term fiat deriving from Latin, meaning "to be done or made" -- replaced these natural, necessary, and qualifiable forms by tying arbitrary and intangible values to their notes, in the form of free-floating exchange rates between promissory notes based entirely upon the unpredictable nature of trust and confidence in future returns. Each of these fiat currencies, beginning with the US dollar, today's global reserve currency, was historically rooted in the promise of convertibility into those aforementioned physical forms. This was the only way by which the people could be convinced to accept the new system, which was unambiguously in violation of Article 1, Sections 8 and 10, of the Constitution of the United States, and which conflicted with the Supreme Court's ruling in the 1870 case Hepburn v. Griswold, in which the Supreme Court ruled that paper money was not and could not be legal tender, as enumerated in Article 1 of the United States Constitution. This ruling would unfortunately endure only one year as law, as the Supreme Court would overrule the decision in Knox v. Lee (1871). In order to understand the nature of the United States dollar, one must first learn about its meaning. The term dollar derives its meaning from the kingdom of Bohemia, located in the modern-day Czech Republic, where, in 1520, minting of silver coins began in the town of Joachimsthal. The coins were originally minted under the name Joachimsthaler, but shortly thereafter circulated more commonly under the name thaler or taler. These terms would eventually spread across the globe, taking the name dollar, a derivative of the Dutch coin leeuwendaalder, meaning lion daler. Eventually, Spanish pesos would become known as Spanish dollars, and by the late 18th century, many American colonists had begun trading paper currencies backed by the dollar. Thus, the dollar was a sum of silver which backed the paper notes, and the silver itself was legal tender, not the notes. Thus, in 1792, the U.S. dollar was born, and U.S. Secretary of the Treasury Alexander Hamilton defined the dollar as a unit of pure silver weighing 24.057 grams, declaring that all forms of the "money of account" in the United States be expressed in such terms or parts thereof. After more than a century of economic development, inclusive of the American Industrial Revolution, the United States dollar would maintain a longterm trend of purchasing power appreciation until the introduction of the Federal Reserve system in 1913 and the later so-called "progressive" agendas of neo-liberal politicians, chief among them Franklin Delano Roosevelt, architect of the New Deal. The Federal Reserve system and the later agendas of "progressive" politics aimed to further cement the idea of central planning: the belief that some arbitrary common good may be achieved through the oversight and administration of expert committees, and that economic output and the standard of living could be stabilized through deliberate manipulation of the money supply, interest rates, and lending standards. Roosevelt's Fannie Mae (Federal National Mortgage Association) and Freddie Mac (Federal Home Loan Mortgage Corporation) teamed up with the existing Federal Reserve and other New Deal programs, such as the Social Security Administration, to fulfill this role and to give credence to the government in its repossession of personal responsibility and individual liberty. Let us remember, money must be valuable, usable, predictable, portable, divisible, acceptable, durable, fungible and scarce. These characteristics are the foundation for any asset which is to become usable as a popular store of value. This is the nature of money. This was the story behind the dollar, before it would be forever changed by the Roosevelt administration in 1933. Historically, US dollars were "redeemable in gold on demand at the United States Treasury, or in gold or lawful money at any Federal Reserve Bank," as was printed on the very bills of that time. In 1933, however, in an attempt to expand the institutions of government and the dependence upon the paper money system, President Franklin Roosevelt endorsed the criminalization of gold and silver ownership for any purpose other than that of jewelry or decoration. The removal of the United States from the gold standard would become complete in 1971, with the Nixon Shock which ended the universal gold standard and effectively dismantled the international, post-WWII Bretton Woods system which depended upon the stable, convertible, and predictable U.S. dollar. All of this was the consequence of imprudent and irresponsible extravagance: the pursuit of politically expedient agendas, including the New Deal, the Great Society movement, the military industrial complex, and the enormous costs of the space and arms races, at the expense of present, future, and unseen measures of productivity, and thus the ability to service those exorbitant levels of debt. Following the Nixon Shock, the United States would go on to experience a government-induced energy crisis and various booms and busts engineered by foolish monetary, fiscal, and financial policies. Each of these crises has stemmed from the unwarranted monopoly of government over the monetary supply and regulatory practices. Government is the greatest producer of moral hazard, and the greatest threat to liberty. In the end, the freedom to decide how we spend our money is the lifeblood of liberty everywhere. For over a century, the Federal Reserve system has presided over the worst economic crises in the history of the the United States, and it is currently on pace to set the table for the greatest financial meltdown in the history of the world. The United States is the greatest debtor nation in world history, and it is by no mere coincidence that it has operated under the system of a fiat currency easily manipulated by the printing press and backed by nothing but popular sentiment. This is the cautionary tale of a form of money backed by nothing. This is the case for sound money, and the threat posed by anything which claims to replace it. In principle, the cryptocurrency bears no specific equivalency as it is pegged to nothing beyond the variable yields of that limited market of participants. When people wake up early in the morning to commute to their workplaces and toil away, or in some cases just allow the minutes to elapse until they punch out, they are counting on their compensation returning a specific predictable value, lest the product of their labor be devalued to leave unsatisfied their various personal and household demands. This is the source of the micro depression, whereby the market actor’s individual expectations were buoyed to an unsustainable level, leaving the actor with a level of exhausted time, resources and opportunities that fail to match the assigned value whose carried assumption inspired the continued toil in the first place. In an environment wherein compensation is as variable as any unit of account that routinely wavers by 10% to 50% or more in a given month, week, day, minute or second, the laborer will inherently feel inspired to explore alternatives that offer a far more stable or reliable denomination for his or her efforts. As it turns out, more than half of Americans are living paycheck to paycheck. Put another way, roughly 50% of Americans are woefully unprepared for a financial emergency, while nearly 20% of Americans have nothing set aside to cover an unexpected emergency, while roughly one-third of Americans don’t have at least $500 set aside to cover an unexpected emergency expense. This suggests that most Americans, despite any single person’s proclaimed penchant, are plainly incapable of relying on any form of money that has the capacity to underperform for even the shortest period of time, as they need to be prepared to pay balances on their credit cards, their utilities bills, their rents or mortgages, the interest and principal on their auto and tuition loans, and other accounts that collectively threaten to catapult the average American into the abyss of bankruptcy in just short order. 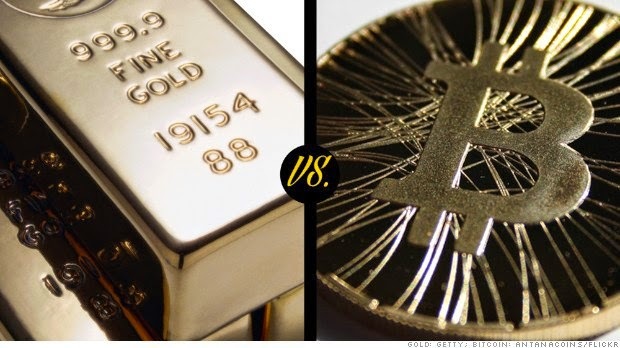 Now, many surveyors have begun to claim that Bitcoin will serve just as well as gold as an inflation hedge. However, Bitcoin, among other cryptocurrencies, hasn't yet demonstrated any such qualities as a pure inflation hedge, any more than it's proven to be anything beyond a highly speculative asset absent a store of value. Surely a fragment of the population has fled USD in support of the cryptocurrency, but those persons, the majority of whom might likely identify as anarcho-capitalists or libertarians, constitute an infinitesimal share of the total population. The only shared properties between gold and bitcoin are their respective capacities to serve as decentralized mediums of exchange and units of account. Among their primary distinctions: a holder of bitcoin must necessarily liquidate his or her bitcoin before realizing its utility. The fundamental question surrounding cryptocurrencies is whether their stratospheric valuations have flown to present heights on the basis of their infrastructural technology or on the backs of hopeful speculators praying for a higher price tomorrow. Next, as these prices climb and that technology becomes more ubiquitous, we may see a myriad of cryptocurrencies competing themselves to near-zero. We'll soon find out. If you are searching for the ultimate Bitcoin exchange company, then you should pick Coinbase. Cullen Roche's Not So "Pragmatic Capitalism"